Through the laying of mines in and around agricultural land, the self-supply was severely disrupted: fields lay fallow, cattle have been killed and the search for water and firewood have become a life-threatening task. The mine contamination of the villages and towns made it impossible for the refugees to return. 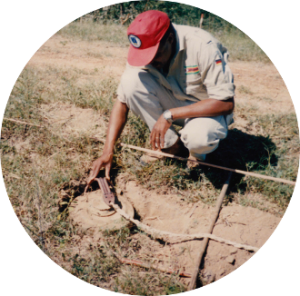 The St Barbara Foundation has implemented humanitarian mine action projects and complementary measures in various localities in the provinces Benguela, Huila, Cunene, Kwanza Sul and Bengo for 13 years. More than 600 square kilometers surface, many kilometers of roads and important bridges have been cleared from mines, unexploded ordnance and ammunition and enabled the return of the refugees and displaced persons to their native villages, the recovery of safe and secure living conditions as well as the resumption of agriculture and livestock farming. By rehabilitation of the roads and bridges the supply, transport and goods traffic were again possible via a direct route. The reconstruction of infrastructure and new settlements followed. During the many years of St Barbara Foundation’s work in Angola more than 250 local employees/deminer have been trained.